The above quote by Isabella Mary Beeton, written in her book, The Book of Household Management, in 1861, most certainly applies to boats and is the motto we try to abide by on Long Passages. 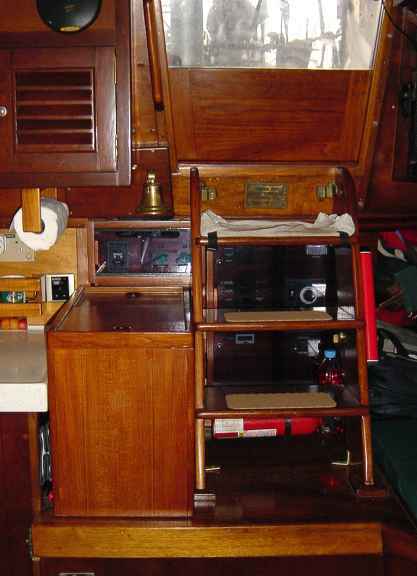 Listed below are some common and uncommon items that are usually found on cruiser's boats and how we solved some of the storage problems encountered on a 38' boat - one that is considerably smaller than most cruising boats today. You may be surprised at some of the unusual items for which you may have to find "homes". Containerize Place like items in one or more container(s), usually plastic. You lose some storage space, but we have found that it makes life much easier. See Galley Tips for examples. -Inaccessible space in galley - cut access hole on counter top, cover with Corian lid. -Space between drop-leaves of Captain's table - built holder for liquor bottles. 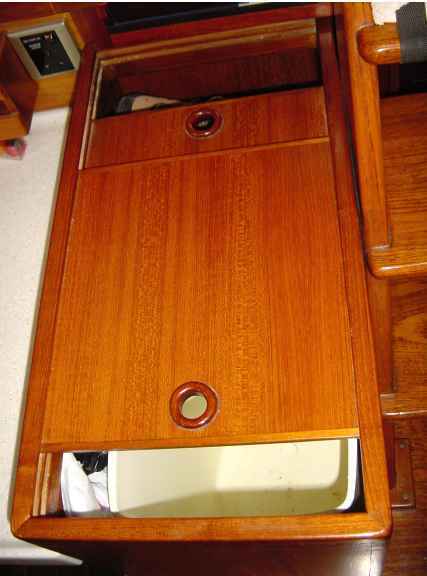 In Thailand we had a storage box built to stow shoes and trash - items we had struggled with for years. 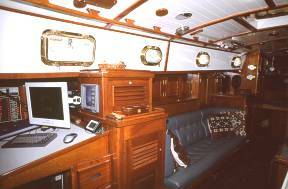 It occupies unused space near the companionway. Boat Maintenance Items 2 Varnish, paint, Cetol, brushes, sandpaper, polish rags. Most of these items are stored in a medium, square TupperwareTM container in the starboard cockpit locker. The container is rugged and waterproof and contains the mess if a container leaks. Truly a problem for us as we both love books and subscribe to a couple of cruising magazines. 3 Once a book or magazine is read, we trade it or give it away immediately. The rule on our boat is that if we want to keep a book, we must find a permanent home for it on the boat or give up a book that we already have onboard. We have a couple of permanent book storage areas on Long Passages and 2 teak magazine containers - one in the "reading room" (head) and one in the main saloon. Charts 3-4 We have over 300 charts and nautical publications onboard. The charts have been organized by region of the world and placed in large plastic bags made for charts - 1 bag for each region. These bags and the other publications are stored in a locker built specifically for them on the port side of the main saloon. 24 We rotate our clothes depending on the season or climate. In the tropics, our warmer voyaging clothes, sweaters, scarves, hats, gloves, etc. are placed in 'vacuum bags' and stowed in the back of our hanging lockers and vice versa in the colder climates/season. Foul weather gear stored in small, cramped wet locker. Laundry 3 We have struggled with where to put the laundry for years. We now place it a small locker in the V-berth area - not the best option. Luggage, backpacks 2-3 Vacuum pack in plastic bags. Frames are hard to stow. Small tool drawer under Nav table for frequently used tools. 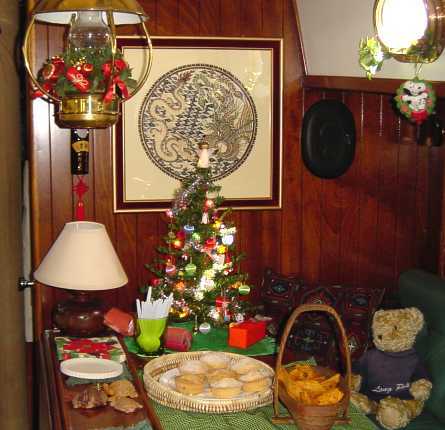 Christmas Decorations Judi could not bear to have Christmas onboard without some decorations. So, following our philosophy for always finding a permanent home for things we found an out-of-the-way storage area under the starboard settee and in the RADAR cabinet for these items. Computer equipment and supplies Almost all cruising boats have at least 1 computer. It is a challenge to find a dry place for the computer, peripherals and supplies. We have Pelican waterproof cases for offshore storage or carrying in the dinghy. 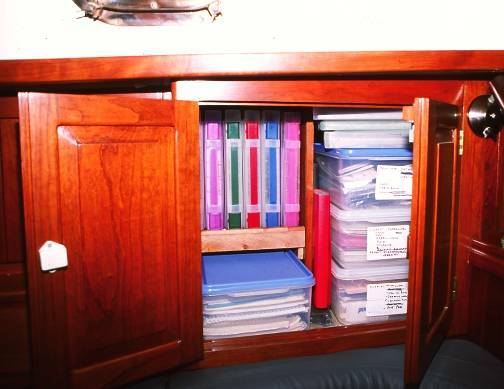 We built a special locker for our 'navigation' computer which folds up against the bulkhead in order to protect it from splashes that could potentially come down the companionway. We then installed a flat screen monitor, use a wireless mouse and keyboard. See pictures on the Boat Changes page. Kept in standard computer bag and used when we are at anchor or in a marina. 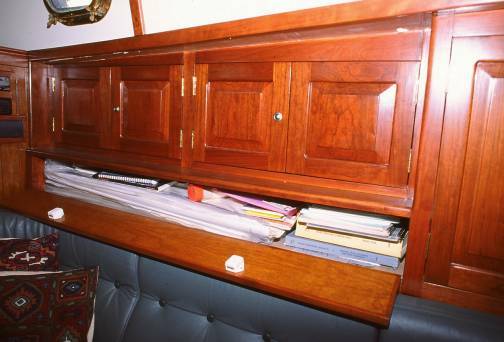 Built into a cabinet along the port side of the main salon. All supplies are stored along side the printer. Film (40 rolls) Should be refrigerated in tropics; slide film hard to find many places so we carry a supply with us. Medicines Most prescription medicines should be refrigerated. Sandals and the like are placed in a canvas bag when boarding boat. The bag is placed below in the quarter berth when underway. All other shoes go in the back compartment of wooden box that we had built in Thailand. The front compartment holds a rubbish container. Databases We have created several MSAccess databases to store crucial information regarding the boat, contacts, expenses, item inventory, food inventory and location. If you choose to create similar databases, it is EXTREMELY important do perform regular backups to your data. Contains addresses, phone numbers and email addresses about friends, family, and companies and our daily expenses. Food items, quantity and storage location. Information on charts and other publications such as Sailing Directions, Cruising Guides, Light Lists, etc. that we have onboard. This is our most important database containing technical and location information about everything we have onboard and in our storage locker in the US. Documents maintenance activities performed on Long Passages. CDs We have several CDs with cruising guides, SSCA guides, old scanned financial records and computer backups. 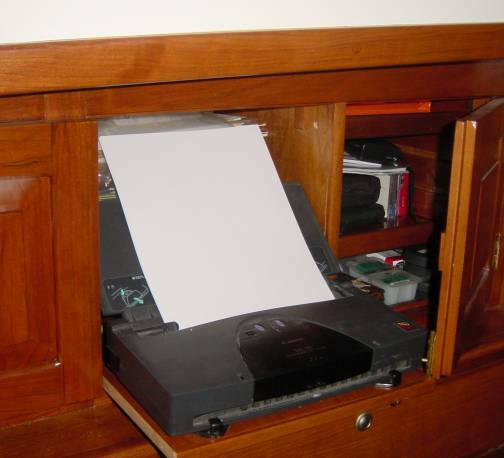 Scanned Documents Instead of filing bills, forms, receipts, warranties, social correspondence, Christmas cards, etc. we scan many of them and store them in softcopy, printing them out if required.